“Workers are not beggars. We don’t deserve alms and wage increase that will only be used for publicity and grandstanding of those in power,” said Jun Ancheta, Kilusang Mayo Uno Metro Manila spokesperson. Labor groups under KMU Metro Manila and Defend Job Philippines troop to the regional wage boards office meeting. KMU Metro Manila and Defend Job Philippines held a picket protest at the Philippine Trade Training Center in Pasay City, where the Department of Labor and Employment – Regional Tripartite Wages and Productivity Board – National Capital Region (DOLE-RTWPB-NCR) conducted its public consultation for labor sector on minimum wage increase for NCR workers today. KMU Metro Manila spokesperson Jun Ancheta speak to the press. The group said that the Duterte government must show compassion and concern to our working people by providing wage hike that will truly be helpful and beneficial for all Filipino workers. KMU Metro Manila also demanded to DOLE and to President Duterte to enact the P750 national minimum wage for all workers across the country. 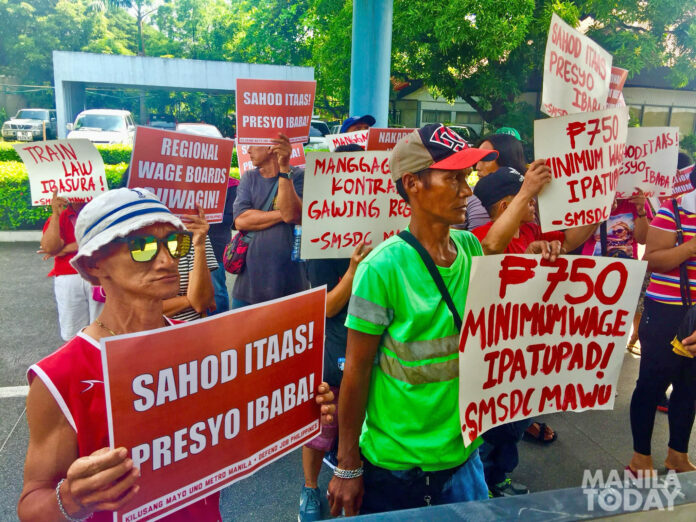 They insisted that a standard minimum wage nationwide could somehow help working Filipinos survive the rising cost of living in the country. Workers ‘die-in’ to call for wage hike and national minimum wage. To do this, he said said that it is high time for the Duterte government to abolish the Regional Wage Boards, which they said have long been discriminating workers in provinces and depriving them of of higher wages. KMU Metro Manila and Defend Job Philippines called for the abolition of regional wage boards.